Kebbah is the main district in the City of the Seven Faces, where our story is set. 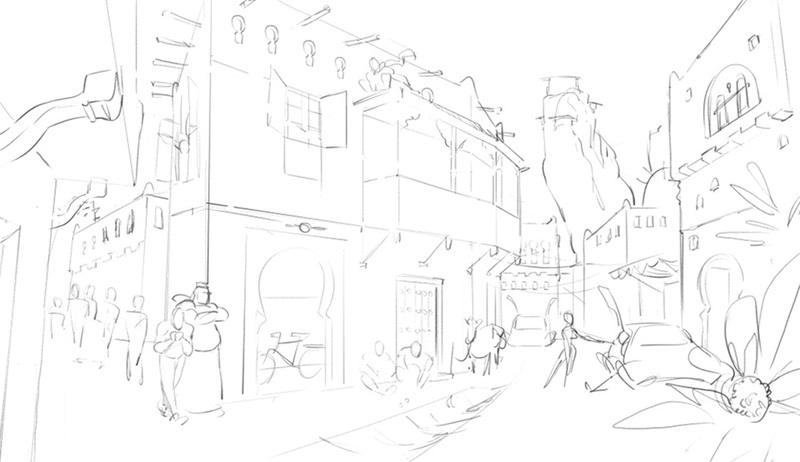 Streets of Kebbah wasn't the first piece of art Shof created for Tales from the Jonahverse #1, but it was the first complete tone piece. Most of the art he'd done prior involved alien and vehicle designs, as well as character sketches. This piece was intended to bring all those elements together and make sure they worked in context. 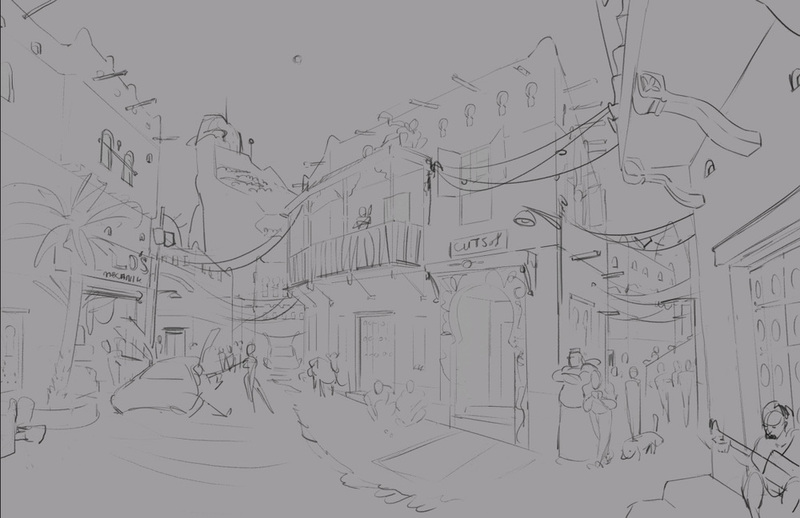 Shof worked on Streets of Kebbah while I was working on the script, which meant he was adding details, characters, landmarks, and making revisions as the script evolved - it was pretty neat to see! The barber shop, panther, and hilltop palace seen in the final version below are all part of the story to some degree. I flipped the initial sketch for compositional and narrative reasons. Initially the sketch was set up so that Abdullah (the fellow pulling a jacket around his shoulders) walking in Kebbah would be the focal point, and his entourage dominates the narrative of the image. Instead, I decided I wanted the character relationships to be ancillary, more matter-of-fact, so that the image is more about the town as a whole rather than Abdullah. I wanted the viewer to see the space in the distance first. The sky is a triangle that highlights the palace on the cliff face, then the viewer's eye flows naturally down and into the narrative of the street scene from left to right. The cliffside monastery in the initial sketch was changed to a palace to reflect the developing script. We actually changed the look of the palace even more now that the layouts are done, it's inspired by Ouarzazate now. I used references from several Moroccan cities like Marrakesh, North African towns like Djenne, Stone Town in Tanzania, and Moorish architecture in general. For color, I wanted to make sure the world looked appealing and inviting. Most North African towns in this architectural vein are an earthen monochrome palette but use accents of color to add richness and personality to the landscape. I tried to do the same, trying to adhere to my personal style of impressionistic color. And that's yer lot! In the next post I'll talk a little about the story, and how the project itself came together. Welcome to the Coker CoOp Blog!